Raina does it again. I've read every one of her books, and they always manage to be entertaining, funny, and heartfelt. Her books can be enjoyed by the Middle Graders to whom they're marketed, but loved just as much if not more by adult. Ghosts is just as wonderful as all her other books. What struck me most about Cat and Maya, the two main characters, was their different reactions to the ghosts. Cat is the older sister who has to be the responsible one and make a lot of sacrifices for her younger sister with cystic fibrosis. She is a quiet, subdued, and cautious person. Cat is enraged by the idea of ghosts. She thinks it's stupid and a waste of time - but most of all, she's afraid of them. She's afraid of death and can't bring herself to think about losing her younger sister. Maya on the other hand, embraces the ghosts. She takes full advantage of every aspect of life, going in with joy and enthusiasm. She reminds me of a puppy. Everyone is a new friend. Maya loves the ghosts because they're exciting, but also because she's fascinated by death. She wants to know what it's like. Not necessarily out of fear, but more curiosity. Even though she doesn't want to die and has some fear about it, she recognizes the real possibility of death in a way that most kids don't. None of this was explicit in the book, but it's very much how I took it. The ghosts in this book are portrayed as being real. But I think their literary function was to get the characters to grapple with the concept of death - even though it's not talked about specifically very much. The ghosts and Dia de los Muertos, when they all come out, is handled with such joy. The ghosts are fun people and their presence is a time that everyone in the community celebrates. Dia de los Muertos has always been a holiday that fascinates me. I'm happy that it's getting more publicity these days than when I grew up. It's a great way to introduce kids to the holiday if they're unfamiliar with it. I have read a few reviews saying that the portrayal of Maya's CF, while not inaccurate, does not really reflect the experiences of most kids today with the disease. With better treatments, it often doesn't have as severe side effects as she experiences in the book. But I don't have firsthand knowledge of CF, so I don't know that for sure. I did like the portrayal of the disease in the book. It helps make kids with health problems seem less scary or "other" when they're portrayed as joyful and fun as Maya. Ghosts manages to tackle a lot of issues in a way that doesn't feel like an "issues" book at all. It makes you think in a rather sneaky manner (I don't mean sneaky in a bad way). You're having so much fun whilst reading that you don't realize that you've been introduced to so many new experiences and complex emotions. 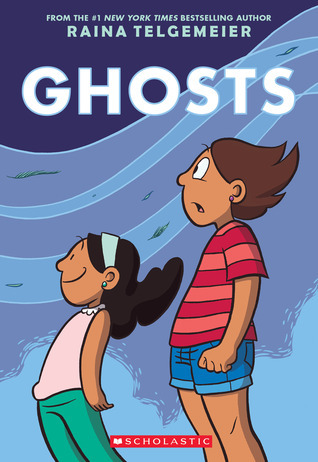 Ghosts is a book that every kid should read and every kid and grown-up with love. Recommendation: Buy Ghosts and also buy all of Raina's books! I haven't read this, but I do know that there are over 100 kinds of CF, with vastly differing severities of symptoms. I can't wait for this one! I bought Raina's graphic novels for my library and was worried that the teens would see them as "kid's books" but I can't keep them on our shelves. I love the sounds of this author's characters! Her portrayal of CF sounds heartfelt - it is so easy to get things wrong, at least she gave it a go. Great review honey! Hello! I just stumbled on your blog via the feature & follow posts. I also received this book as an ARC but have yet to start it. It looks and sounds so good. I've been getting more into middle-grade books lately.